Purchase a Pocono Mountains Golf-A-Round Card for just $45 and play twice at eight of the region&apos;s golf courses for just $25 per round with cart. Browse the participating courses below to experience golf’s best destination secret. BUY NOW! 1. Country Club of the Poconos – With a backdrop of the Pocono Mountain foothills and the Allegheny Plateau, Country Club of the Poconos offers beautiful scenery complementing their environmentally-varying course. The Par 70, 5,902-yard course features four sets of tees fit for all levels of play. 2. Hideaway Hills Golf Club – From remarkable elevation changes to the signature island green, Hideaway Hills features pristine golf on 300 acres thanks to their tee-to-green automated irrigation system. Enjoy the spectacular views of the region while perfecting your swing. 3. Jack Frost National Golf Club – Jack Frost offers a 7,200-yard course, contouring to the mountainous landscape of the Poconos. The picturesque topography also provides wide fairways, easily identified target areas, few uneven lies and no blind shots. 4. Pocono Hills Golf Course – Noted for its challenging greens and rolling fairways, Pocono Hills Golf Course is a short, tight mountain course maintained for all skill levels. 5. Pocono Manor Resort & Spa – Designed by classic-era giants William Flynn and Donald Ross, Pocono Manor golf has delighted pros and beginners for over 100 years. Arnold Palmer and Sam Snead are among the many who have played the iconic links. Come play for yourself. 6. Shawnee Inn and Golf Resort – Completed in 1911, the Shawnee Inn and Golf Resort has a rich history in golf. Shawnee’s golf course was the first design of famed architect A.W. Tillinghast and hosted both the 1938 PGA Championship and 1967 NCAA Championship. The course is primarily flat, and 24 of 27 holes are located on an island in the center of the Delaware River. 7. Skytop Lodge Golf Course – Golf Digest&apos;s “Best Places to Play” rates Skytop Golf Course at 4.5 stars; ranked among the finest in the East. The rolling terrain and tree-lined fairways are atop a private plateau on 6,656, secluded yards. 8. Split Rock Golf Club – Split Rock’s 27-hole, two-course layout attracts players of all levels. Experience incredible views of the Pocono Mountains, boasting one of the most spectacular views in the entire Northeast. Afterwards, grab a bite to eat at the on-site Sunset Green Restaurant & Bar. 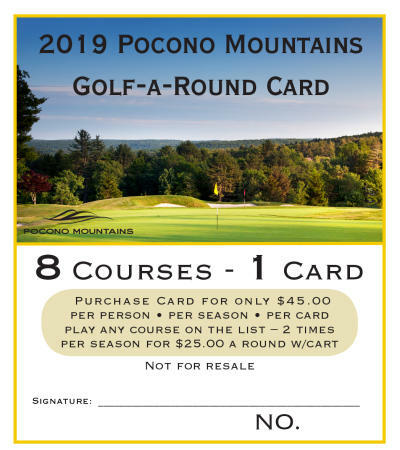 Buy your card by May 1, 2019 to enjoy National Golf Day right here in the Pocono Mountains! Some restrictions may apply. Card is valid after 2 p.m. on Sunday’s only and all-day Monday-Friday. The card does not include holidays and is valid for the cardholder only. You must call for tee times and mention this card; tee time can be made three days in advance. Tee times are subject to availability. Not valid with any other offer or tournament play. Card is non-transferable and can be purchased online or at our office on Main Street in Stroudsburg. Interested in more ways to save on golf? Golf packages are available for a Pocono Mountains golf getaway. Customized golf packages are accessible, as well, and can be tailored to your specific interests.